On July 19, 2013 the last incident update reported a total area of 109,615 acres lost and 66% containment with 43 personnel engaged in combating the blazes. Not a fun time and very scary. My heart goes out to those in the Pacific NW and particularly Washington State who are fighting so many wildfires right now, and I pray that all will be safe. Things can be replaced people can’t. That truth that was brought home last week as I participated in a public tour of the Papoose Fire burn site, smallest of three fires of the West Fork Complex. 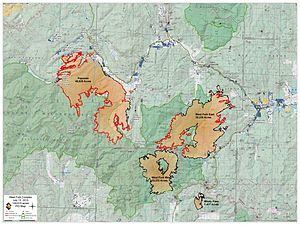 The Papoose Fire destroyed more than 49,000 acres. It’s the area on the bottom right in the picture above. Even though a total of over one hundred thousand acres burned, there was no loss of human life or homes. That is an amazing accomplishment and the West Fork Fire Complex has become a study model for methods of fighting future wildfires. Before we left the Creede Forest Service office, I picked up a tour partner. 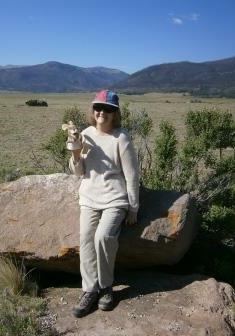 I named him Round Rabbit after Flat Stanley, who traveled with me on many other adventures. Mike Blakeman, with the Rio Grande National Forest Service, and Emma, a natural resource coordinator with the Rio Grande Watershed Emergency Action Coordination Team (RWEACT), conducted the tour. A lump formed in my throat seeing all the charred and blackened pillars that used to be trees on the drive up to Fern Creek. 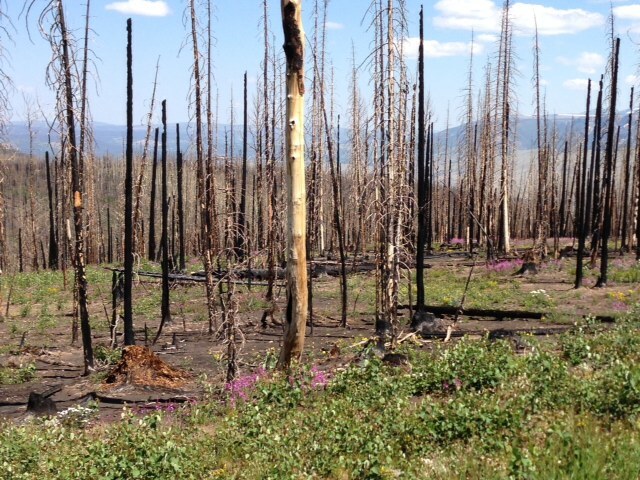 Yet as we traveled up the mountain to the burn site, spectacular groups of purple and yellow wildflowers that Ranger Mike called fire flowers flourished in the ash. The high intensity fire had burned or seared the surface, but underground seeds of the perennial plants survived. Clusters of Aspens, which also spread via a root system, were everywhere along our route. Soon the former green mountain views will be dusted gold and yellow every fall. Aspens can grow to heights of ten to fifteen feet in ten years. So while the old views of the Rio Grande Forest have been permanently changed and the vision of so many burned trees is devastating, the new growth testifies to how things can be replaced. The pine and spruce trees will take hundreds of years to repopulate making the look of the forest very different from the past, but nature has a way of balancing itself. We went to a RWEACT site where Emma and Ranger Mike explained how RWEACT is conducting controlled studies of methods to reclaim and prevent runoff damage. The group is also working with the Forest Service to explore how to use the acres and acres of burned wood for the development of biomass as an alternative energy source. Learn more about the recovery work of RWEACT here. Some of the burn areas remain unstable as the dead and burned trees can easily topple to the ground. But, the good news is Forest Service has stabilized and opened most of the trails and fishing sites…and the fish are biting. You’ll enjoy the scenery in the Rio Grande National Forest campsites even though it’s not exactly beautiful (except for the lovely purple and yellow fire flowers). You can see how things are okay after a fire’s devastation and maybe you’ll catch some fish. 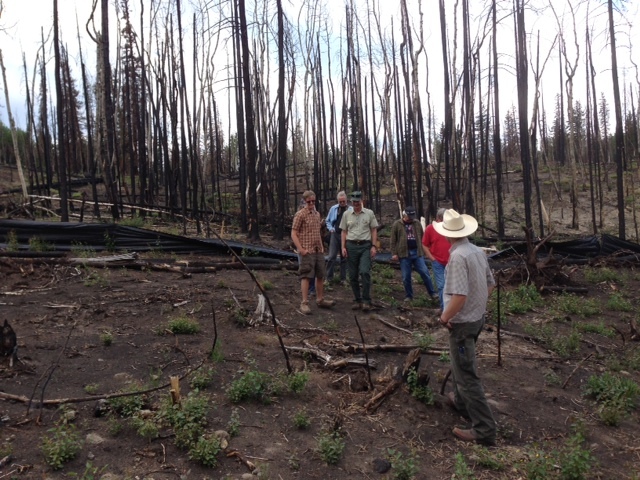 In August, Round Rabbit and I will join a similar tour of the West Fork Fire burn area. 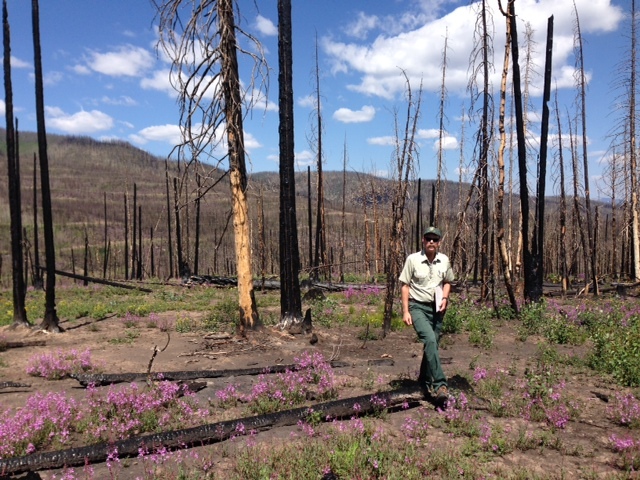 Count on another blog with pictures of the recover in that area of the West Fork Fire Complex.